The Kansas Department of Agriculture Division of Animal Health has received notification of multiple confirmed cases of West Nile virus (WNV) in horses across the state over the past few weeks. Confirmed cases have been reported in Lyon, Seward, Neosho, Marion and Wichita counties. WNV is a preventable disease, with annual vaccinations that have proven highly effective. All of the confirmed cases of WNV in Kansas were in unvaccinated horses or horses with an unknown vaccination history so were assumed to be unvaccinated. 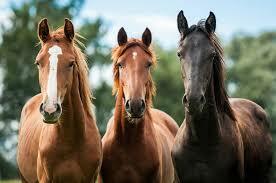 All horse owners should consult with their local veterinarians and make a vaccination plan for their horses. WNV is a virus that can infect humans, horses, birds and other species. Horses infected with WNV can have symptoms that range from depression, loss of appetite and fever to severe neurologic signs such as incoordination, weakness, inability to rise, and hypersensitivity to touch or sound. WNV can be fatal in horses. If you see symptoms of WNV in your horse, contact your veterinarian immediately. For more information about West Nile virus or other animal disease issues in Kansas, go to the KDA Division of Animal Health website at agriculture.ks.gov/AnimalDiseaseControl.